What could possibly be more enjoyable than hanging up your apron for an evening in favor of indulging in restaurant-prepared fare? The correct answer is: “When the food comes to you!” Offering instant culinary gratification and diverse dining themes to suit every palate, mobile food carts and eateries have taken the world by storm, offering patrons the opportunity to gamely gobble up tantalizing morsels of gastronomic goodness that fulfill their every dining desire. If you keep a watchful eye on city streets, evidence of their prolific food-pimping nature materializes at every turn but those who desire a virtual tour should sit tight because the following list of unique traveling eateries will undoubtedly whet your appetite! Part of the simple pleasure of sampling street food is taking a culinary and cultural journey via willing taste buds without being forced to hop on an airplane. In a way, enjoying the fare of mobile eateries is inherently easy on one’s carbon footprint since the best way to chow down is while ambling along the sidewalks sans vehicle. 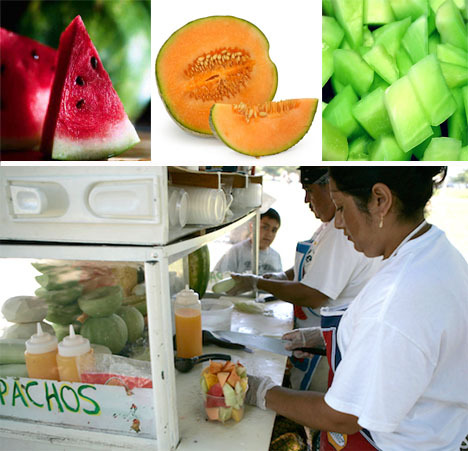 This is perfectly illustrated with Gazpacho’s Stand, a Lincoln Park, Chicago-based culinary cart that serves, surprise-surprise, a freshly minced concoction of juicy-sweet pineapple, mango, melon, and other succulent fruits enhanced with a dash of orange and lemon juice as well as cayenne pepper and a pinch of salt. ¡Ay caramba, that sounds refreshing! 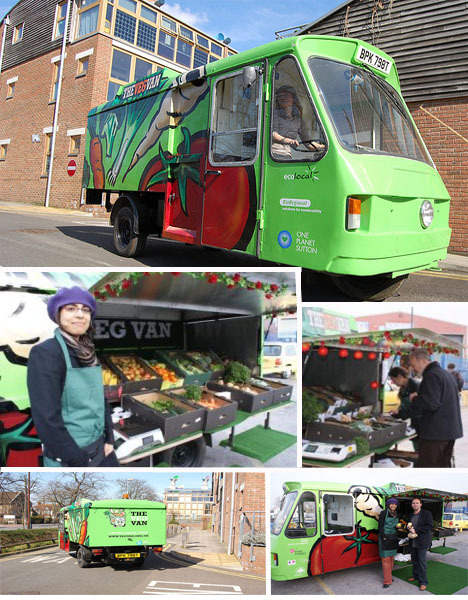 Hold onto your Twinkies…The Veg Van is poised to give fellow British food system reformation trouble-maker Jamie Oliver a run for his chicken-nugget-hating money with its once-a-week rail station appearance in London’s Hackbridge neighborhood. 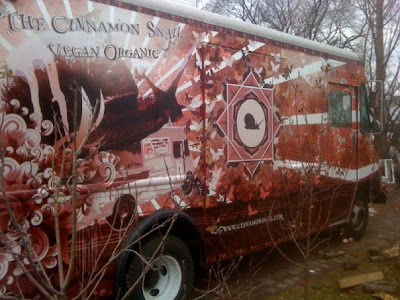 Within the four walls of eco-charity EcoLocal and BioRegional’s mobile retrofitted milk truck turned veggie vehicle, healthy living enthusiasts can find local, organic and seasonally fresh produce options that offer no more excuses for residents to tuck into the closest convenience store for a Mylar-wrapped snack instead. The healthy initiative is intended to make fresh, wholesome food readily accessible as well as affordable, ideally discouraging residents from hopping in a car and driving long distances to fulfill their veggie fix. 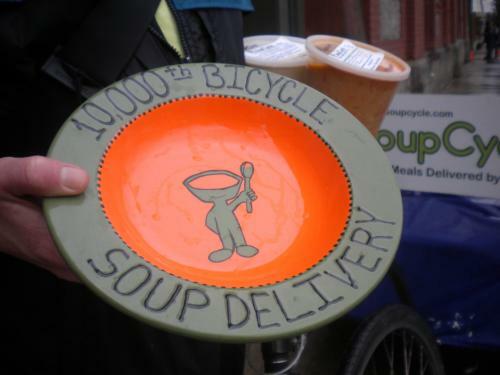 Mmmm-Mmmm Good Soup, Biked Straight To The Portland Hood! 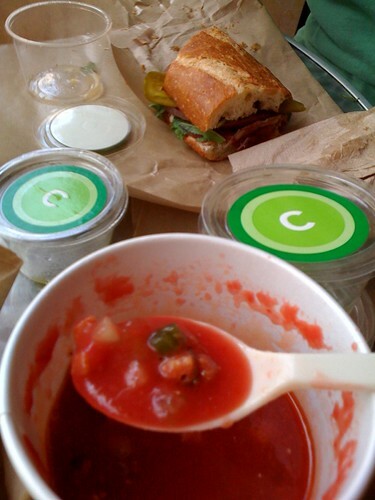 For an instant-gratification, quickie meal, it used to be perfectly acceptable to reach for a humble can of factory-manufactured soupy goodness, but thanks to Portland’s Soup Cycle, iconic red and white labeled containers across the nation should probably turn in the towel. That’s because homemade soup blows away thin, over-salted, bright-pink-pseudo-chicken-flecked concoctions any old day and homemade soup delivered straight to your doorstep? Well, that just blows canned versions entirely out of the water and into the recycling facility where they rightfully belong (after rinsing them out thoroughly, of course). 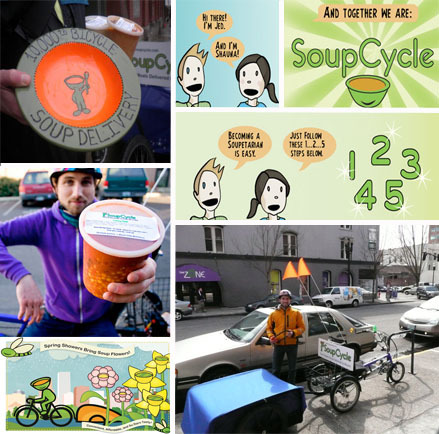 Shauna Lambert and Jed Lazar’s seasonal, sustainable and entirely local soup subscription service puts their low-carbon leg-generated pedals to the metal by toting internet-ordered, freshly prepared gourmet varieties along with rustic bread and dressed greens via bike to households in the Portland, Oregon area. Poise your spoons and move in for the slurp! 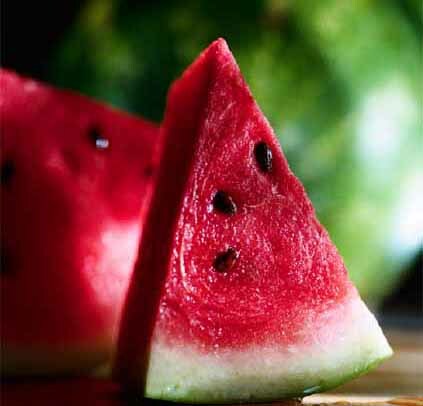 Experiencing the sweet nectar known in certain circles as culinary ambrosia can be as simple as jetting off to Phoenix and hunting down the Truckin’ Good Food cart. Making each and every meal that they serve a full-on dining experience, they wisely capitalize on the fact that everything is infinitely more delectable when stuffed inside an entirely homemade, meltingly good crepe. 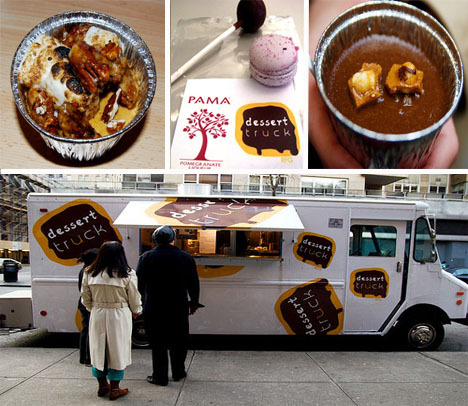 Indulging both savory and sweet cravings, the Truckin’ Good Food mobile cart serves up vegetarian and more toothsome offerings that sound positively divine, that is if a jicama, carrot, cilantro, aoili stuffed buckwheat crepe or a caramelized pineapple, toasted coconut and chocolate crème stuffed sweetened crepe floats your boat. Anchors aweigh! Despite the fact that 3.2% of the U.S. population (an estimated 7.3 million individuals) eschews meat and 1 million of them are vegans, there are still many people who are unclear regarding what this dietary choice is all about. Essentially, it is a lifestyle in which one makes a conscious effort to refrain from consuming all animal derived products while also foregoing all animal-related exploitation via fashion, entertainment, medical procedures, etc. 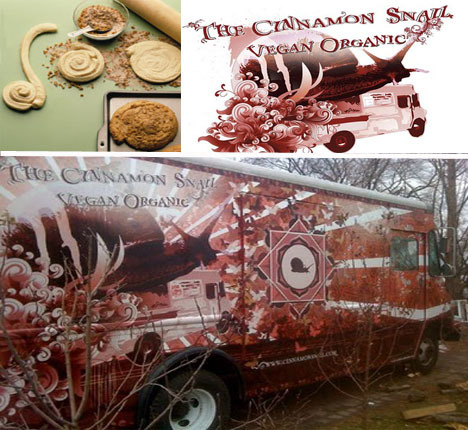 The Brooklyn and Hoboken based Cinnamon Snail prides itself on catering to this ever-growing market with their extensive array of homemade, inventive and wholesome 100% organic and vegan breakfast and lunch offerings. It’s difficult to imagine that anyone could miss the meat with selections as hearty and original as Smokey Portobello Carpaccio, Pignoli Butter Slathered Blue Corn Pancakes or Apple Cider Glazed Tempeh paired with marinated kale and rosemary root vegetable puree. Knives need not apply! Following an evening of alcoholic debauchery, there are those of us who lean heavily on the rejuvenating effects of a smothered burrito, a gallon of coffee and a few ‘hail Marys’ while others prefer the holy trinity of aspirin, copious amounts of Gatorade and the comfort that only their favorite blankies can provide. 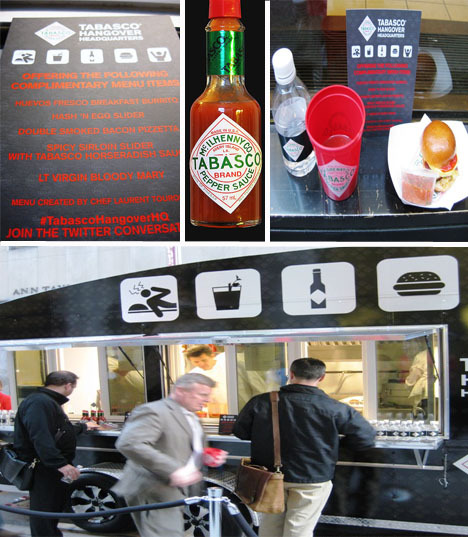 McIlhenny Company apparently believes that their 142 year old Tabasco sauce can soothe the savage hangover beast, which is why their specially designed special edition New York City food cart – appropriately dubbed the Tabasco Hangover Headquarters — offered free pepper infused virgin bloody Marys, sirloin sliders, bacon pizzetas and perennially pleasing burritos with a kick to savvy city dwellers in-the-know following this year’s St. Patrick’s Day festivities. Mmmmm-mmmm, there’s nothing like self-imposed taste bud incineration to clear the cob webs out of one’s head! Taking portable and eco-friendly eats to the next level, Chef Daniel Noiseux’s local seafood based menu has taken Montreal by storm and not merely because it’s lip-smacking-good. 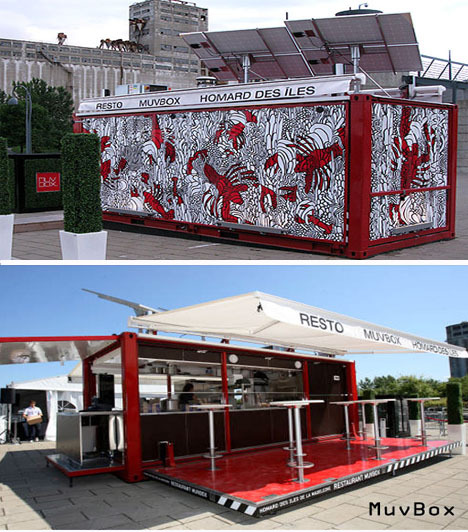 His kitschy-cool pop-up MuvBox eatery capitalizes on the infinite repurposing capabilities of a standard shipping container with its state of the art kitchen, retractable outdoor dining accommodations and roof mounted solar panels. 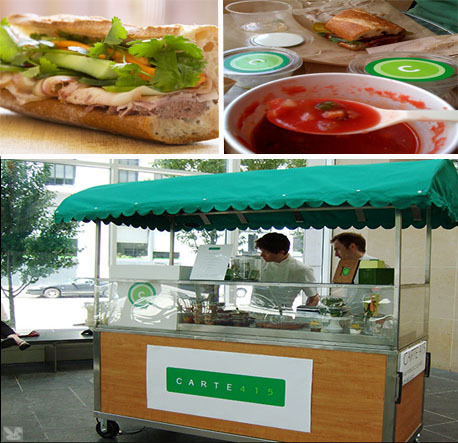 Cleverly capitalizing on seasonal patrons, the gourmet eatery is here today and gone tomorrow, able to be transported to any potentially lucrative tourist destination whenever the whim strikes. 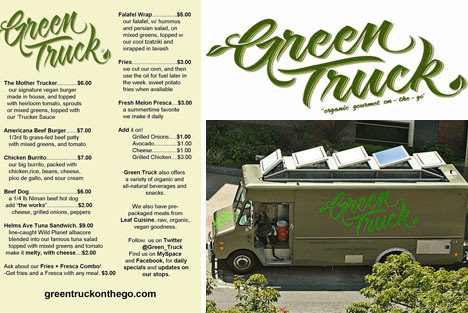 Serving wholesome, stick-to-your-ribs gourmet fare that appeals to both conventional diners and those who prefer their eats to be free of all pesticides, hormones, chemicals and funny business, the 100% earth friendly Green Truck – fueled with recycled vegetable oil and biodiesel – strives to “heal the planet one meal at a time.” Los Angeles, Miami and New York City dwellers can saddle up to the solar powered commissary for hearty breakfast and lunch entrees that span all cultural boundaries and rest assured that their fish is mercury free, their chicken free range and their veggies local and certified organic. This is as far from McDonald’s as one can possibly get, and after one taste of the Green Truck’s rosemary fries, you might be tempted to turn your nose up at the golden arches once and for all. 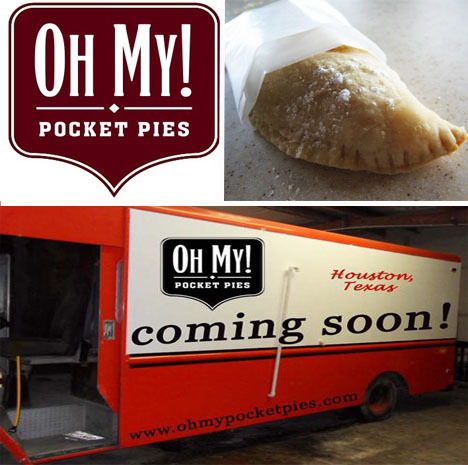 Notorious for its biggie-sized everything, the Lone Star state is not the first place one might imagine a cute little mobile pocket pie eatery setting up shop in. Nevertheless, Oh My! Pocket Pies’ Houston-based reasonably priced hand-stuffed $3 savory pastries rival their equally intriguing $2.00 dessert versions – think Chicken Pot Pie and Chile Relleno to S’mores and Seasonal Fruit & Cheese. 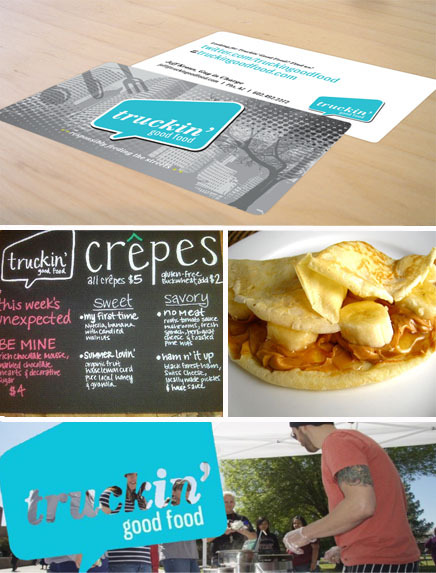 Yet another mobile eatery focused on offering budget friendly fare with minimal environmental impact, they do their best to source local ingredients at all times and dispense to-go orders exclusively in recyclable, biodegradable and/or compostable containers. Sometimes big things really do come in small packages! 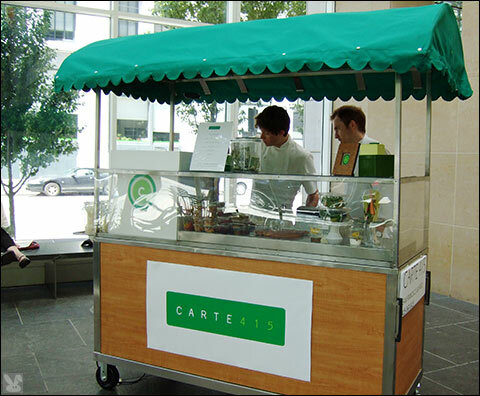 Joshua Skenes’ San Francisco-based Carte415 is able to serve enthusiastic foodies high caliber, sustainable lunch selections at incredibly reasonable prices because the overhead on his portable, electricity-free food cart is so low. 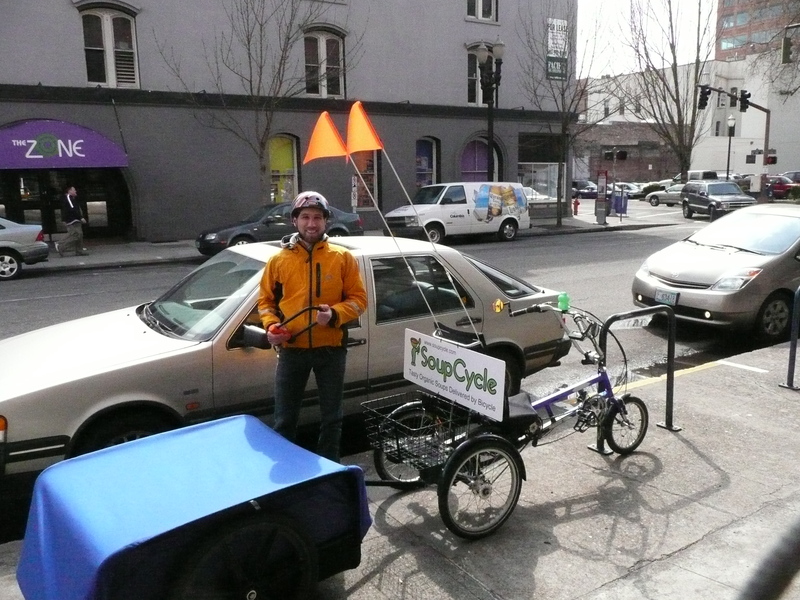 His green canopied, human-powered cart — constructed out of recycled and repurposed materials – is not the only planet friendly item on the menu. Featuring seasonal produce along with sustainably raised meats in one aesthetically pleasing textural and taste bud tantalizing package, Skenes’ fare comes together with a refined edge that you would expect in a four star restaurant – plus, he packages it all in potato starch and corn plastic based to-go containers that are 100% recyclable and compostable. I’ll eat to that! 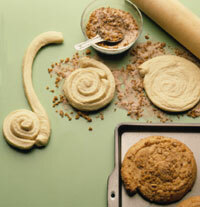 Up until last year, New Yorkers had yet another reason to rejoice, gastronomically speaking. By kicking their hoofing into high gear (specifically to the Greenwich Village vicinity), they could conceivably pre-burn the thousands of calories they likely inhaled while feasting on one (or many) of Dessert Truck’s insanely divine I-can’t-believe-I’m-eating-something-this-good-on-a-street-corner sweets. The love child of a former Le Cirque pastry sous chef and a business school student, the mobile vendor of unquestionable decadent selections like Gianduja Pot de Crème with Hazelnut Brittle, deep-fried pastry cream filled sugar dusted brioche Bomboloni balls and Vanilla Crème Brulee (among many others) – which donated proceeds from select menu items to charity — met its untimely demise last year due to licensing red tape. Rising like a Phoenix from the flames, they have now set down roots in a new brick-and-mortar location located in Manhattan’s Lower East Side and still strive to dispense indulgent items that don’t cost an arm and a leg. 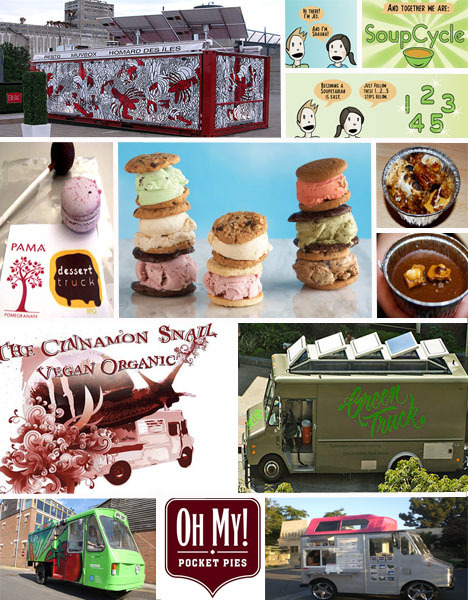 Mobile Ice Cream Treats That Can’t Be Beat! 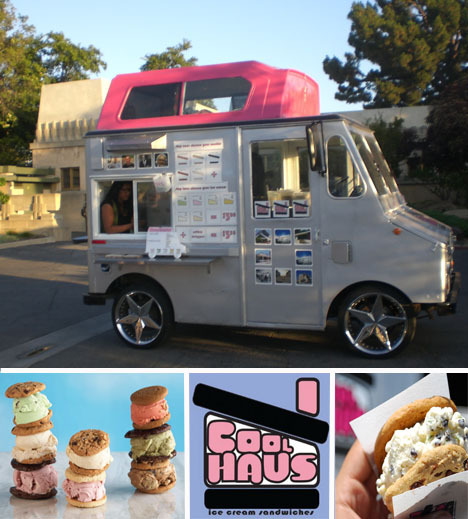 When traveling a couple of miles to the closest ice cream emporium seems as oddly burdensome as lifting an old reliable pint of Ben & Jerry’s to your lips, the architecturally inspired Cool Haus Ice Cream Truck is on the scene to turn that frown upside down. 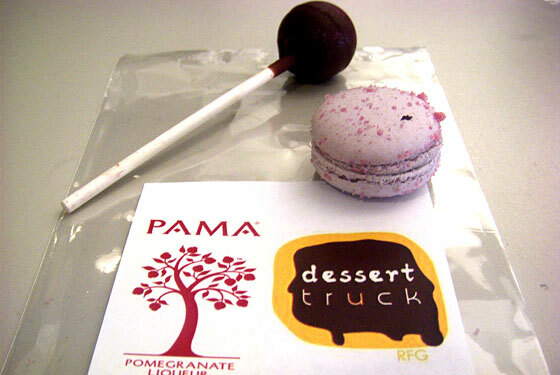 Focusing on sustainability and minimal waste, a retrofitted bubblegum pink and silver postal van dispenses organic and locally-sourced confections contained within edible wrappers throughout the streets of Los Angeles. 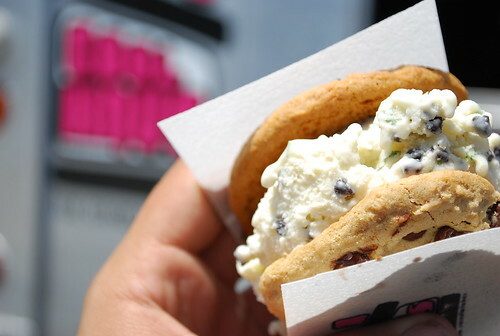 Named after architectural gems and their designers, five different types of ice creams are sandwiched between complementary cookie sandwich flavors, delivering a one-two-punch of novelty and homey satisfaction that has earned them quite a dedicated fan base.